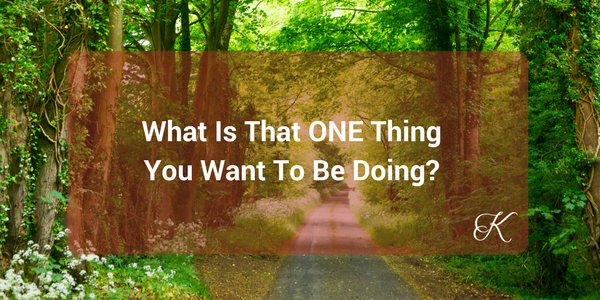 What is the ONE thing you want to be doing? We’re BUSY with our to-do lists. We’ve got to service our clients. One part of our business is sucking up a lot of our time. Distractibility …. Yup. I want you to stop. Take a break from your to-do list for a few minutes. And tell me, if I had a magic wand, and could grant you the business of your dreams within 6 months, what would that look like? Would it look like it does today? Or do you want to be doing more speaking? Writing that book? Doing more workshops? Go ahead, dream big. Remember, I have a magic wand. Write out your day, how does it unfold? Who are you spending time with? Now, go on over to LinkedIn. Take a look at your headline. Does it reflect that big goal of yours? Often, I’m finding it does NOT. I speak to people every day about how to use LinkedIn to build a nice profitable sales funnel, a funnel that brings their business to that big dream place. But almost always I need to convince them to declare it in their headline. Convince them! Craziness. So if speaking is a goal of yours, declare it. Call yourself a keynote speaker in your headline. Please don’t make things up! But if you’ve ever done a keynote talk, no matter the size of the audience, you’re a keynote speaker. Own it. Are you a Realtor who is looking to crack a new sales milestone this year? OWN it. Step in to it. Start using the words to describe yourself. I want you to do the same. Our big dreams CAN be achieved, but they start with US. We have to own it and declare it, and LinkedIn is the place to start. Tell the world how great you are! If not you, then who? It’s not bragging, it’s owning our worth and owning our dreams. This is the first step to achieving. Tell the world what you want them to know about you. Drop your LinkedIn headline in the comments below, I’d love to cheer you on! Assist others to lead with integrity, purpose, and make effective long term change. Executive Coach and Consultant.